My theory is one of creative collaboration and joyous affirmation — activating change through the inspirational power of the arts and affecting the individual on a deep emotional level, which can be imperceptible, as well as through more visible and public, celebratory and collective community action. People may look to statistics and metrics, such as numbers engaged and gardens saved, which we have — but more importantly, change happens when individuals introduce new ideas and demonstrate alternative modes of action, which through social relationships are disseminated and amplified by collective action. Creative collaborative action puts forth a process that is as much a goal as the results it aims to achieve, and through art provides an experience of change — a bridge to new perspectives, new connections, and new ideas, that is visceral, tangible, emotional and deeply transformative. Felicia Young is a native New Yorker who has been creating collaborative social action artworks for 30 years. She has worked in the pageant format to create large-scale, site-specific celebrations of the Hudson River, the gardens of the Lower East Side in Manhattan, and the Vaigai River in south India. Felicia is probably best known in the US for her “Earth Celebrations” pageants which both celebrated and protected community gardens using colorful costume and joyful procession. Chloe Grey: Can you tell me a little about your practice and how you came to it? Felicia Young: Well, the term ‘social practice’ didn’t exist until fairly recently. I studied art history and I knew I didn’t want to have anything to do with the commercial art world, with art within the confines of galleries and museums, and when I graduated my first job was with the Alternative Museum, a social and political art space in New York, as a gallery coordinator. And we were doing these amazing shows on political issues, but who was coming to them? Just other artists; it was still this very insular world… That’s when I decided I wanted to leave the “art world,” and go out and work with people in the community – a diverse group of people, including people who weren’t artists and artists who were just part of the neighborhood. Because there was no field, there was no roadmap. Now that people have caught on to ‘social practice,’ the gatekeepers have arrived. If social practice is supposed to be about engaging people outside of the art world, spreading culture democratically, they’re bringing that same elitist attitude out into the streets! It just seems like now that the art world gatekeepers are here, they’re selecting a narrower and narrower group of people. CG: Yeah, it’s important to really respect the people who are on the ground creating things before those things have a name. But continue! FY: So in college when I was studying abroad, I studied the French Neoclassical artist Jacques-Louis David. And he’s known as a painter, but at the same time as he was painting portraits of Napoleon he was also orchestrating these incredible pageants! They were “festivals of the revolution,” all sorts of intellectuals were involved, they were leading the people through the streets in costumes. So that really got me started on thinking about the role of the artist, not just as a painter, not just commissioned art, and I learned that a lot of famous artists got involved on the side with bringing their work into the streets. I was really questioning what the purpose of art is in our society, seeing art not just as something to sell. When you look at most cultures throughout history, art isn’t separate, it’s integrated into the life of a community. It’s part of culture, ceremony, healing. In Igbo Nigeria, the whole community will come together in response to a crisis and commit to art making (mbari). A whole section of the community will go into seclusion for years, and the rest of the community will support them, and when they’ve created this beautiful, intricate ceremonial hut and had a celebration with the whole community, they walk away and leave it to decay. So the ephemeral nature of the project appealed to me as anti-commodity statement; it’s about the process. And I wondered, in our own culture, can we have a similar process? I don’t necessarily believe in the magic power of the piece, like in mbari art, but I did see that a community working together through that process builds solidarity. Whatever calamity they were dealing with, it strengthened their bond and their resolve. CG: OK, so the community, in your case, was the gardening community? FY: Well, my first pageant was with the Alternative Museum in 1988, for exhibition addressing homelessness. I proposed doing a pageant and reached out to establish partnerships and engage the creative participation of women in a homeless shelter through the Artists/Homeless Shelter Collaborative and with an AIDS day treatment center. I embedded myself in these communities for months engaging participants through workshops creating visual art and poetry, which resulted in a procession to City Hall. I saw that engaging communities outside the art world to express themselves publicly on issues affecting their lives could be successful. Then I went to India – I’m half-Indian – to document the pageants there. The Chithirai Festival pageant involved the whole city and neighboring towns and goes on for a month – community drama on the largest scale. So I was convinced that the pageant form was the way to go. When I came back I was living on Forsyth and Grand, near Adam Purple’s Garden of Eden. Few people outside of Alphabet City knew the gardens existed. It was a flash of inspiration, as I had recently returned from India and thought I could apply the structure of a large-scale pageant to bring attention to the community gardens and propose the idea of their permanent preservation. I went to meetings at the various gardens, community centers, churches and schools telling them of the idea for the pageant. People were enthusiastic. I enlisted gardeners, local artists, residents and children. We managed between workshops in gardens, community centers and my apartment the first year to make the costumes and paper mache puppets for the pageant. CG: How did the gardening community respond? FY: I think that when you have an idea, a really good idea, people come to you. All the gardens got involved with presenting and creating performances of dance, theater, music, poetry and ceremonies, even just telling their story. It took six months of workshops and, by the end of the first year, we had involved several thousand people. 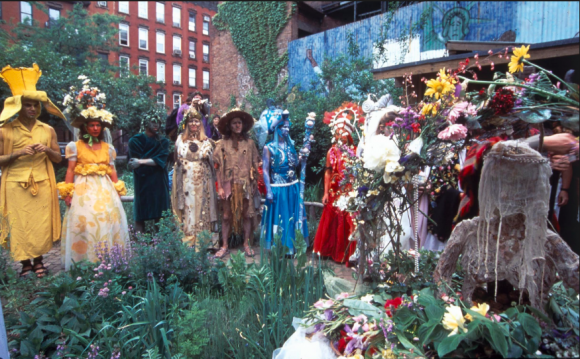 The creative and collaborative process culminated in a day-long 10-hour public theatrical pageant through the streets, visiting the network of over 40 community gardens throughout the Lower East Side. The Procession of costumed characters and giant sculptural puppets representing the species of the gardens visited the each garden with performing a ceremony of exchange– offering a flower bulb and then receiving a flower from the garden. This was followed by the gardener marking their garden on a giant ceremonial painted map of the neighborhood where they would mark their garden in green, as a ceremonial gesture to signify one of the goals of having the gardens mapped as “gardens” on city maps and not as “vacant lots”. Following this ceremony brief performances expressed the gardens history, achievements and struggle for preservation. We even visited gardens that were bulldozed performing memorials at these sites. It was extremely emotional. The garden spirits were performing a “thank you,” to the gardeners for cultivating the gardens, but it was also a march of support for the gardens . It’s a ten-hour pageant, it’s long and difficult to do — it requires endurance and dedication– it wasn’t supposed to be about entertainment. I hadn’t originally intended to do it for more than one year, but people came to me after the first year saying what characters they wanted to play, so I developed this mythic storytelling element, about the spirits of the garden. After the first year, the schools we worked with had integrated our workshops into their curricula. Theatre for the New City let us use their space, and I was able to raise some money and we’d gotten over 50 different community organizations involved. By the 4th year I was able to rent our own permanent space at the 6th Street Community Center. CG: Impressive! So how did art fit into this? FY: People cared about the issue, people believed that their story needed to be told, but I really believe that we never would have been able to form this broad coalition of people if not for the art part of it. I came at it as an artist wanting to have impact rather than an activist trying to incorporate art into it. Without the art, we wouldn’t have gotten three-year-olds in butterfly wings, families… we wouldn’t have engaged all these people who didn’t consider themselves activists. We would’ve had the garden people, maybe the activists, but all these other people wanted to be a part of it because it was celebratory and joyful, creative, educational… People were in it for many different reasons, and we were able to knit together the divided groups of the neighborhood. There were points of entry for different people. By the time we had been doing it for a few years, in 1994-1996, when the gardens were really in trouble, I was the only one who had the phone numbers of all the different gardeners because I’d been organizing the procession in between them! In 1994, we called a public meeting and from that formed a coalition on the Lower East Side to explore possibilities of forming a Land Trust and options for preservation. Earth Celebrations then was also coordinating monthly coalition meetings establishing committees working on research, mapping, press, and outreach. Then in 1996, in response to Mayor Giuliani aiming to destroy over 800 gardens throughout the city, we initiated the citywide coalition. We have brought together these two approaches and entities. It was a fusion, with the garden pageant project and the coalition that did traditional activism, like letter writing, rallies, and talking to city council members with the integration of creativity into protests. For the first rally of the New York City Coalition for the Preservation of Gardens as City Hall for Valentines Day in 1997, letters in support of the gardens along with flowers were delivered in a procession with colorful flower puppets to the various city council members offices. And I think in the long run, the two integrated approaches, bringing together a collaborative art project and a coalition to save the gardens, informing and strengthening each other, was what made us so effective. When you’re looking at social practice art, you have to consider at what point you meet up with the issue. So for me, it was that the gardens weren’t organized as a coalition, no one was organizing on the issue of preserving the gardens, and the pageant became a way to strengthen that community and works towards these goals. Because even in the beginning we were getting coverage from the New York Times, this community telling its own story got broadcast to the larger population of New York. It was a creative story, but it was also a real story, a struggle. We weren’t just putting on these community plays, we were marching in the streets, visiting the actual sites. It can exist and be perceived both ways [as a march and as an art project]. And I think there’s a lot of power in that. And it even got more powerful once we started doing it every year. Many gardeners started viewing their gardens as community and cultural spaces. CG: So how does that relate to your later work in India? FY: After the garden project, I had a child and I spent a lot of time taking her to the playground on the Hudson River, and it was a time when the city was investing a lot of money into renovating the waterfront. And I was really interested in investigating how we could use a pageant to get people to (re)engage people with the waterfront. With that project, I wasn’t coming in at a time of crisis, it was more about getting people to engage with a river that was already coming back to life. We used the same method of community workshops, getting different groups involved… and it was really positive, but it was a different point of impact. We definitely educated people about things like catch-and-release fishing, oyster planting, we got people involved who otherwise wouldn’t have been involved with the waterfront. But it wasn’t a crisis. You can’t just manufacture a crisis – and then the question becomes, should you leave your neighborhood and go to somewhere where there is a crisis? In 2013 I spontaneously went back to the city in India, Madurai, where I had been documenting the pageants, and I found out that my whole family is actually from there – when I first started documenting pageants I had no idea, but it turned out my family had been living there for 300 years. So I went back and I was talking to friends there that I had interviewed 25 years earlier, and I asked this guy, who had been working at the American college there, what he was up to, and he said he’d been working on a book with an American professor about the Vaigai River. I said, “well that’s funny, because I just did a pageant about the Hudson River.” And completely spontaneously, I said, “we should do one about the Vaigai.” And when I saw the river, and saw how polluted it had become over the last 25 years, I really started to think there was something there. I mean, I had been inspired by their art form, and it worked in New York, so I brought the idea to an NGO there and they said, “let’s do it!” So then I had to find some way to fund it, and I met this Columbia professor, Geeta Mehta, and she got on board as a partner and sponsor. And so I spent the next year and a half flying back and forth, doing the same process – workshops with local folk artisans, schools – taking the issues we identified and turning them into creative works using indigenous art forms. It was a different way of working because we were integrating traditional folk art forms and working with artisans who may be the last generation passing on these traditions, and innovating and applying these forms to express the issues of the river. We ended up in a pageant in May of 2015, where we had over 3,000 people marching along the banks of the Vaigai River, with giant sculptures, visual art, dance, music, poetry and ceremonies. Here I am as an outsider, half-Indian so I have a slightly different status, and I kind of came to represent the Hudson and its 50-year transformation, like a cultural diplomat. As an outsider, you can’t just come into a community and tell them what to do. They will accept you if you come representing a message you bring from your own hometown that’s of interest to them. And you have to leave things open – I was one person, coming in as a facilitator, but I was partnered with an organization that had deep roots in the community. People have to embrace it, and you can’t just be shoving an American thing at them. It’s a delicate balance. By being a foreigner, you bring a lot of attention. In the end, through Geeta, Columbia University has started an exchange program with Madurai collaborating on proposed designs for restoring the riverfront, they sent students there and brought a professor to New York. After we did the pageant, the mayor and the Collector (governor) officially appointed a panel for the restoration and cleaning of the river. I think there was generally a feeling that it [the creative project and international attention] strengthened their ability to take action. It helped them get a seat at the table on a national level. CG: So it’s not that it wasn’t effective, it was just effective from a different inroad? FY: No one had started the Vaigai River Project as a city-wide initiative. My role in doing the pageant was to be a catalyst, but I don’t feel I’m needed to stay the way I was in my own neighborhood. Every case may be different, but in this case it seemed that we needed to get the municipal government, the colleges, the farmers and all these stakeholders involved, using the art and the celebration of their own folk traditions. If we hadn’t used art to bring so many people into it, it would’ve just been a few engineers in an office. So there are real political results. They decided they liked the concept, they liked the emotional connection that art brings. People don’t just think they want to save the river, they feel it. It restores the spiritual connection, it helps people understand their traditions. But it doesn’t need me. CG: People often have a theory of social change — through direct action, lobbying, revolution, etc. Do you have one? Is that spiritual connection you’ve been discussing part of your theory, or do you not see it that way? FY: My theory is one of creative collaboration and joyous affirmation– activating change through the inspirational power of the arts and affecting the individual on a deep emotional level, which can be imperceptible, as well as through more visible and public, celebratory and collective community action. People may look to statistics and metrics, such as numbers engaged and gardens saved, which we have–but more importantly, change happens when individuals introduce new ideas and demonstrate alternative modes of action, which through social relationships are disseminated and amplified by collective action. Creative collaborative action puts forth a process that is as much a goal as the results it aims to achieve, and through art provides an experience of change–a bridge to new perspectives, new connections, and new ideas, that is visceral, tangible, emotional and deeply transformative. We have an agenda – for example, that we want the gardens to be saved – but how do you do that? You need to organize, mobilize, and build coalitions, so part of it is being a catalyst and doing community organizing, but how is that process done? I feel my methodology is doing it through this creative process, and I find that even though it’s not the only way to do things, it’s clearly been effective. Whether we saved the gardens or not, we were having really positive impact. And if we hadn’t done it creatively, I think that coalition would have fizzled out. It helped us keep a broad base, build a positive image and empathy. I think because we had all this beauty and color and poetry, it helped us re-frame the image and narrative. To put all that out in the world is more powerful than anything else we could have been saying. It’s easy to ask for statistics and data, but It’s that engagement and creative collaboration on the community level that’s important. To me, to be able to put that out into the world we live in now is the greatest political act. I wasn’t interested in doing things in an angry way, but in letting the results happen as part of the process. Obviously I had to deal with people that I didn’t like, but I had to say to myself, “you can’t exclude them, because it’s not about you.” We have to have a few rules, for the group to function, but when you do large-scale projects sometimes you just have to grin and bear it. If you look at how these things function in cultures like the Igbo, with their mbari art process, it’s that positive reaffirmation of the community that makes it work. I especially think that now in our culture, when people are so engaged in their computers and are less connected in a human way, this socially engaged art serves as a counterpoint. With the large scale of the pageants, everyone has something they can offer. It’s everybody’s contribution, it gives everyone a goal. CG: So is that how you see your role or work as an artist, as this work of facilitating other people’s creative spirit? FY: Yes, it’s like being a conductor or a director. I personally have a creative vision and I shape a lot of the storyline and the imagery, so I think it’s a combination of directing and creating a framework for other people to contribute. There’s a lot of ability that’s needed to orchestrate that – if we had no framework it would be chaos. With the garden pageant, people were welcome to create their own characters and performances within the structure, but if someone wanted to put on an hour-long play I’d say no. So it wasn’t completely haphazard. It’s a very fine line… you’ve got to know how and when you can place world-class dancers and seven-year-olds singing within the same pageant, because if you didn’t have either of those it would look very different. CG: I want to know more about your markers of success. I know you mentioned that for a lot of what you’ve done, there was no “data” for you. Is there a way that you can “measure” your success? FY: Number one is always community engagement. The art project becomes an excuse for bringing the skills of the community together. The art project has to be something that people care about – if there’s not a clear goal it doesn’t really work. So the community building is one level of evaluating impact. And… when you do a project for many years you create a base that you expand on year after year. These projects are massive undertakings in community organizing. If you can get that many people engaged, something powerful is going to materialize. If you do a purely professional work and you don’t engage the community, it may look the same but they really have nothing to do with each other. I think it’s all about that process. CG: So the process is it’s own success? FY: I think it’s the most important thing. The community engagement, getting people to work together on a collaborative project, is the most important part. It’s a peacemaking thing. And it’s just on the level that it’s existing out in the public streets, not in an art gallery, it’s very powerful – we’re taking over a whole area of the city! The way you measure success changes over time, too. If you had asked me these questions in the midst of the garden project, I think I would have focused on ‘oh, we got two gardens saved this year.’ But years later, stepping back, I can see the broader effect. CG: OK, that makes a lot of sense. But can you give me an example of something that didn’t work – and why? FY: Well, I think the Hudson River project, it’s not that it didn’t work so much as that I didn’t feel obligated to stay in it. With the garden project, every year we could see that we were having impact. And I think the Hudson River project was lacking that. The commitment to the process was still there, but it wasn’t like we were in 1970 when the river was in crisis. So it raised these questions, of what happens over time? When an issue is resolved, do you keep going with it? What are you doing now, celebrating your success? I think when you’re evaluating your work, you need to know where you can focus your impact. And I ended up jumping into this project in India, and it made me think… thanks to starting that project, a whole city now has a mobilization around sanitation and cleaning up this river. Out of an art project! How crazy is that? CG: So even if the goal of the art isn’t to be activist, it’s not art for you if it doesn’t have some greater purpose? FY: Yes, I wouldn’t be doing it if it didn’t have some greater purpose. The whole power of these projects comes from identifying something that people, a community, care about, cause if you don’t, why are you doing it? You really have to look at where that point of impact is, and you don’t control that. You either have to find something in your neighborhood that people care about, or you have to be an outsider and be a facilitator – which I don’t devalue. Nowadays they’re putting artists-in-residence the Department of Cultural Affairs in municipal agencies such as Veteran’s Services, Immigrant Affairs and Child Services, and they are operating outside of their usual community to act as a facilitator for creative projects. And I love the idea of doing that, but your role is very different there. You may not need to remain in the same place for a long period of time so much as be a catalyst. [A lot of places] already have the infrastructure in place for dealing with things like this – like, for example, a water crisis – but you can bring art into it and enhance what they’re already doing. It doesn’t exist alone, it’s most powerful if you have both those things at the same time. For example, in Madurai, they don’t have a lot of toilets, and the public toilets they do have people aren’t used to using them, no one wants to take care of them. But they do have shrines, and they are used to taking care of them and making them beautiful, integrating art into them. So you can take anything, even if it’s a toilet, and you turn it into a project and involve the community – turn it into a sacred space through art and engaging in that place. You can turn anything into art or a performance, but that’s what really interests me, is that the core is something functional. For example with the garden project, if I had just done the pageant and we didn’t have the traditional organizing, if a coalition had never been formed… I think it’s the combination of those two things, over time, that made it have more impact. In India, it’s going to be interesting to see what happens, there are a lot of people there who really see the value in using their traditional arts in that way, so it wasn’t like I was proposing something that they didn’t get. CG: So there’s some kind of cultural precedent for integrating the arts into people’s community lives. FY: Yes, in many cultures it’s much more traditional to do that than in our own. And that was what was so inspiring to me. In India you see people waking up in the morning and doing paintings in rice flour outside of their apartments as part of their daily lives. That’s what reaffirmed it – when I first went to India, I was questioning these ideas of art as luxury, as something you own, and then there in the desert where people barely have enough food and water they’ll travel for miles and miles to get pigments to paint these beautiful paintings on their houses. They didn’t have the luxury to create art unless art was as important as food and water. It’s not something you add on, like decoration, it’s something in the core of their existence. The government brought in trucks of water because there was a drought, and people lined up for it, but instead of drinking it they would spray it on statues as part of this festival. FY: Yeah, that blew me away. It reaffirmed to me that art is not a matter of luxury, and [made me think about] how you get to the core of that creative spirit. In most cultures art is completely integrated into ceremony. Someone like Picasso could get inspiration from African masks, but he’s only looking at the object. I’m interested more in looking at the context it was created in. That art object wasn’t meant to sit in a gallery, it was created as part of an orchestrated, purposeful ceremony. Art isn’t just about creating objects, it’s about creating a meaningful context. So then something like a pen isn’t just a pen anymore, it’s a ceremonial pen. I was experimenting with the idea of the art object being a functional, ceremonial artifact. Nowadays people are really questioning the purpose of art, how art functions in society, and for me it always comes back to this core idea of ritual, and where art gets integrated into life. That’s not for me, but I don’t want to completely judge it! When I approached my own artworks, I just didn’t give a crap about that – it wasn’t created to be viewed in the context of a museum or gallery. I became fixated on the pageant art-form because I was asking myself, “what form can accommodate all the things I want to do?” and the pageant art form just involved everything. It was trying to use public space, the ‘real world,’ as opposed to theater space or gallery space. It answered all of my criteria. I think it’s really important to consider the aesthetic – where do you find the aesthetic of what gets created? Everyone approaches things with their own aesthetic, I just often feel that the art world aesthetic is… alienating or segregating. FY: Yes, and why? Where is that coming from? Why do we gravitate towards something that can be hung on a wall? I get the idea of a museum as a graveyard for art objects that are no longer serving an active purpose, but when we think about how the contemporary gallery system functions, we have to ask, how are these art pieces functioning? They’re functioning as a commodity. Maybe the artist has some higher-minded connection while they’re making it, in the process, but after they make it, it’s bought and sold. I think at this time, when we’re facing so many crises all over the world, it’s sort of crazy for us as artists – who can be so valuable in society to function in such limited ways – when you have all these creative talents that could be applied to some of the most pressing issues of our time, do you really want them to be limited to just this marketplace? When you think about it, essentially, art can be applied to understanding and connecting to the world around us and creating new ways to solve problems. And I think and hope that’s what’s happening now, that we’re putting artists to work in diverse arenas and towards various issues. I think it’s great, now, if people are willing to pay attention to the value that artists have in contributing to many different sectors – but then artists have to be open to thinking about themselves in a different way, how they can bring their creative abilities into other arenas. Like, what is your skill? Mine is creative thinking and organizing, but if yours, for example, is painting, maybe you don’t organize the project but you apply your craft to it. So how do you involve different types of artists into your project, to work together? How do you adapt your skills as an artist beyond the canvas on the wall?